Photograph collection of webmaster. 25111 at Springs Branch depot, date unknown. The sixteen year career of D5261/25111 was allocated to London Midland Region depots apart from a two year period when it was allocated to Eastern & Scottish depots. Never carried 'Domino' headcode display. Time between withdrawal & scrapping: 7 months. 25111 was the 27th Class 25 to be withdrawn, leaving 300 in service. 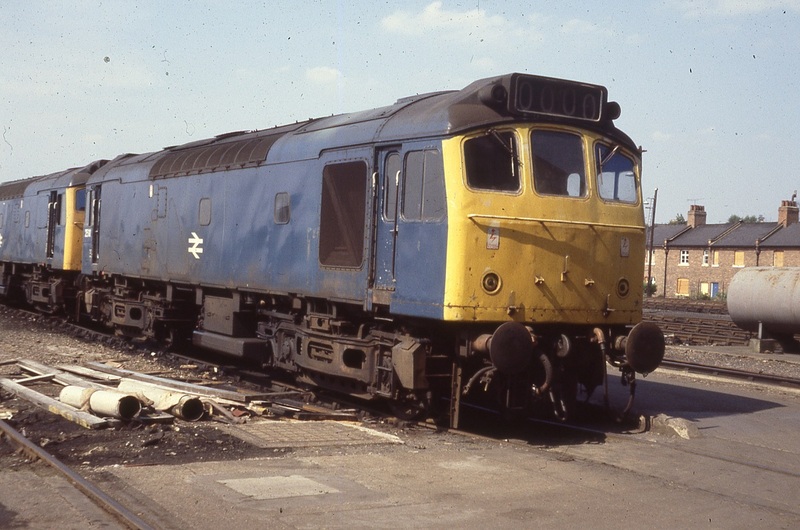 After withdrawal 25111 was moved to Swindon Works on May 5th 1980 and broken up there by the end of October 1980. 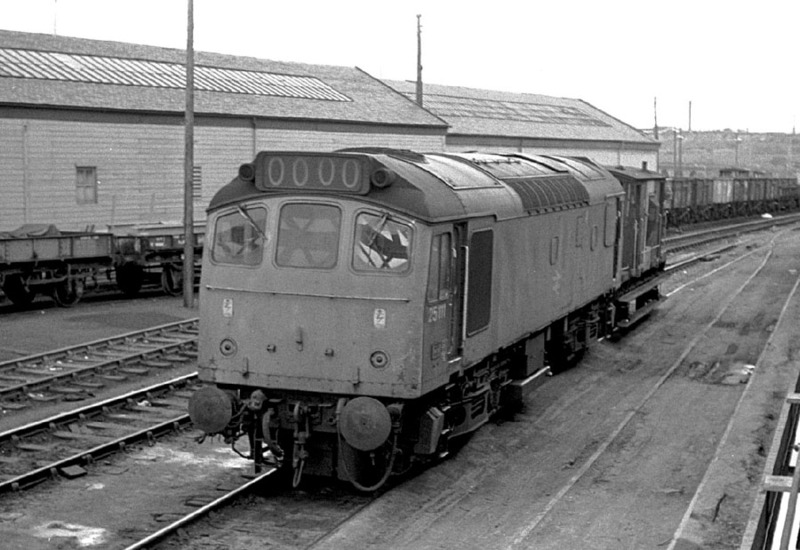 Noted Derby Works August 1964. Noted Derby Works February 1971. Noted Derby Works February & March 1974 (Classified). Visited Derby Works sometime between June 1976 & October 1977. The Wellingborough - Goldington CEGB coal trains still remained strongly in the hands of steam power, usually 8F or 9F’s although on August 12th D5261 handled one of the turns. The passenger miles worked by D5261/25111 were so low that it belongs in the bottom ten of the Class 25 table of passenger workings. On August 14th 1971 a roundtrip Liverpool - Ipswich football special (for Everton FC) was believed worked throughout by 5261 & 7656 for a passenger mileage of 502 miles. On August 24th 1974 the 09.19 Manchester Piccadilly - Yarmouth to Lincoln Central and the return from there of the Yarmouth - Manchester Piccadilly was handled by 25111 & 25081. On June 13th 25137 & 25111 worked an evening Mossend - Kingmoor freight. A Birmingham - Edinburgh service on July 5th was worked forward from Carstairs by 25101 & 25111. Photograph courtesy Tony Sayer. 25111 at Motherwell on June 11th 1976. A roundtrip Lichfield City - Llandudno Town day excursion on June 6th 1977 was worked by 25111 & 25131. On a snowy February 12th 25111 was noted through Beeston (Notts) with a short engineers train. On May 19th 25111 & 25117 were noted passing Claydon with a lengthy coal train, presumably bound for Aylesbury Coal Concentration Depot. 25111 at Cricklewood on August 19th 1978. The continuing shortage of locomotives, partly caused by a backlog of repairs at the main workshops, led to Swindon Works receiving unclassified repairs for locomotive types it had not dealt with before. On March 9th collision damaged 31124 & 31154 were moved from Doncaster to Swindon. Likewise 25191 and 25236 were also received for repairs. During March approximately six hundred locomotives were awaiting attention of which only one third (about 160) were out of traffic for scheduled repair. 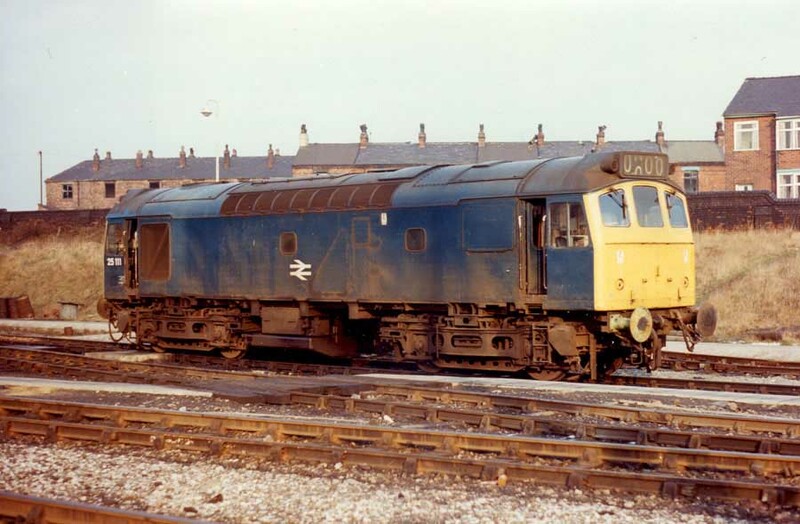 For the Class 25’s fifty eight were laid up, the Class 31’s had thirty out of traffic, whilst for the Class 47’s one out of every five machines was awaiting some sort of attention. Eight Class 25’s had been out of traffic for at least three months (25035/42, 25113/147/177/191, 25234/252), obviously the aforementioned move of 25191 to Swindon was a start in repairing these bad ordered machines. To provide Swindon with a source of spares 25111/147/252 were withdrawn during March and consigned there (25111 was the first to arrive on May 6th), interestingly two of these machines were in the batch long overdue for repairs. 25111 was withdrawn on March 30th 1980. Page added September 29th 2013.